When I was an early reader, I loved reading biographies of famous Americans. I used to hunt down any biographies on famous women Americans . . . but as you can imagine, the pickings were slim in the late 1960s/early 1970s. (I was limited to Helen Keller, Florence Nightingale, and Molly Pitcher.) 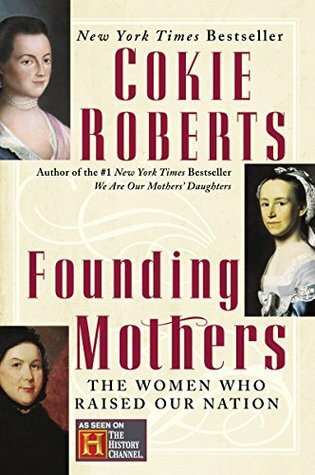 How I would have loved stories about the women in Cokie Roberts’ Founding Mothers! Interesting, broad reaching, and not too heavy with detail, this book provides an inspiring glimpse into the lives and contributions of a huge cast of Revolutionary-era women. Easy and quick to read – and perfect for my book group. I listened to the audio version of this book, and enjoyed hearing Cokie Roberts narrate her book. Recommended to anyone interested in the contributions of Revolutionary-era women, but not looking for a deep dive. Sign into Goodreads to see if any of your friends have read Founding Mothers.